$9 a glass, unlike its cousin the disgusting Clos du Bois merlot, surprisingly, it's a smooth sweet easy-to-drink chardonnay with some Brazilian fried cod fish for a chilly night on Sunset with my exchange student friend from Provence. Short finish, but hey, it's good enough for a glass over a decent conversation. He's just 22 dude! Get over it! I'm really sorry to hear the news about your beautiful dog. I know how bad you must feel. I've been through the same thing, and it was a really dark time for me. I'll keep both of you in my best wishes and thoughts. She's fine when she's with me. How'd the vet visit go...? They took some samples from her in this couple days and will let me know their findings tomorrow or Monday. 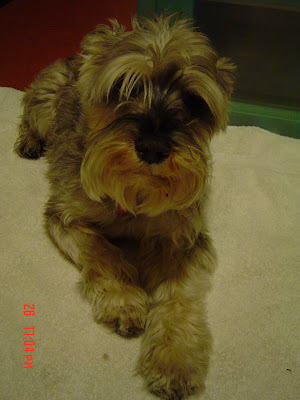 I'm so sorry to hear about your dog's illness- she is so cute (I love Schnauzers). Wishing you and your "biatch" a happy holiday season. Hey Eric, you too, have a good holiday with Isis. Thank you so much.